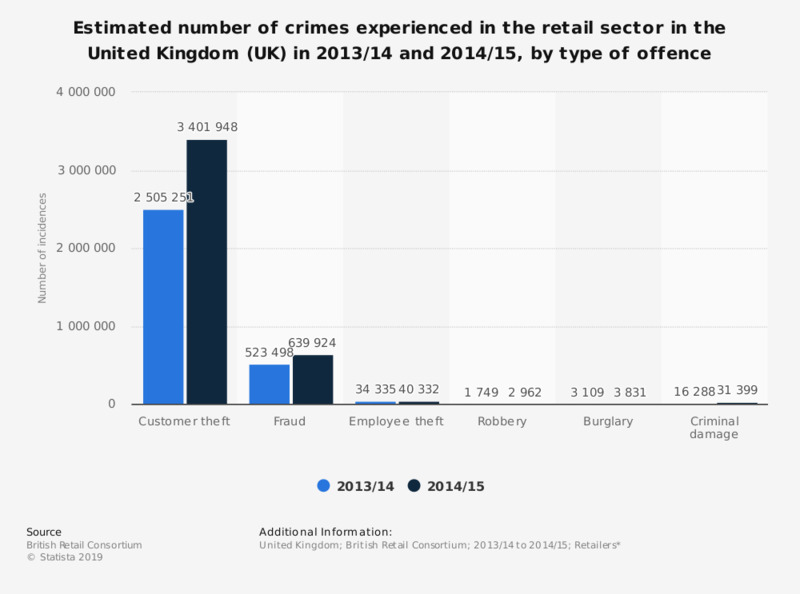 This statistic shows the estimated number of crimes experienced in the retail sector in the United Kingdom in 2013/14 and 2014/15, by type of offence. According to calculations by the British Retail Consortium, the UK retail sector experienced over 3 million incidences of crime during 2013/14, the vast majority of which were customer thefts. * The source provides the following additional information: "(The) sample covered 50 percent of the retail sector by turnover and employed 1.6 million employees. A broad range of retailers participated in this year's survey, from large multiples to smaller retailers, including pure online retailers. The sample included regular participants and new respondents, together providing a representatitive cross-section of UK retailing"